For more information on various local attractions, click the links below! Cutting deeply into the Cumberland Plateau, the Clear Fork and New Rivers come together at the Confluence to form the Big South Fork of the Cumberland River. Their main channels decend approximately eleven feet per mile. The swiftness of free-flowing water through the boulder-filled river beds have created a paddler’s paradise. Although the rugged terrain limits access, there are several popular hiking trails in the south end of the Big South Fork National River and Recreation Area. The Forest is located in northeastern Tennessee, in Scott and Fentress Counties. It is completely surrounded by the Big South Fork National River and Recreation Area. Some land was purchased by the State, but the main portion of the Forest was acquired by the State at a tax delinquent sale in 1938. The Forest is unique in the system in that it is completely surrounded by the Big South Fork National River and recreation Area. Colditz Cove is a 165-acre natural area located approximately two miles east of Allardt, Tennessee in Fentress County. Its most impressive feature is Northrup Falls. This is one of Tennessee’s most stunning waterfalls plunging more than 60 feet over a protruding rock ledge into a scenic, narrow, gorge along Big Branch Creek. Situated in a remote section of the upper Cumberland Plateau, Pickett CCC Memorial State Park is known for its geological, botanical, and scenic wonders. The park lies within the 19,200-acre Pickett State Forest, and adjacent to the massive 120,000 acre Big South Fork National River and Recreation Area, both areas containing prime wilderness country. Frozen Head State Park and Natural Area is situated in the beautiful Cumberland Mountains of eastern Tennessee. With a landbase of 24,387 acres and an additional 20,393 acres added as Conservation Easement in the Emory River Valley and Sunbright Areas, the relatively undisturbed forest contains some of the richest wildflowers areas in Tennessee. 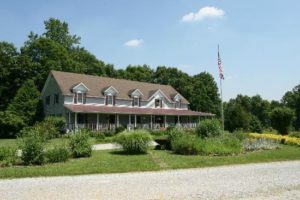 Grey Gables Bed & Breakfast Inn is nestled on the outskirts of Rugby, Tennessee just off of highway 52. Operated by Linda Brooks Jones, many events and activities are offered throughout the year. The ten bedrooms, decorated with country and Victorian antiques, show the grace of the English and cordiality of the country. 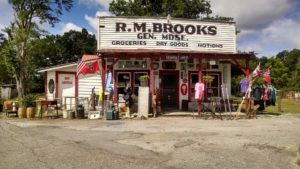 Built in the early 20’s this country store still remains in the Brooks family, fourth generation granddaughter Tiffany Terry and her husband own it. The R.M. Brooks General Store is located at the west end of Rugby Village s and is now on the National Register of Historic Places. Brooks Store offers breakfast and lunch (including the fried baloney sandwich voted best in the state). There are also hundreds of antiques from the early days of the establishment, fried pies, collectables and other delights. Sergeant Alvin C. York State Historic Park is located nine miles north of Jamestown in Pall Mall, Tennessee and pays tribute to one of the most decorated soldiers of World War I. The park includes a visitor center modeled after York’s general store, his two-story house, a gristmill, the York Bible School, and various picnic facilities. The York Farm was designated a National Historic Landmark in 1977. Just outside the park are the Wolf River Methodist Church where he experienced his religious conversion and the Wolf River Cemetery which includes the burial site of Sgt. York and his wife, Miss Gracie. While these properties are not owned by the park, they are accessible as part of the driving tour or via the park hiking trail. Relive the past in this Mennonite community. The general store and mercantile store offer home-canned and fresh baked goods, pottery, handcrafted items and quilts. The wood working shop offers handcrafted furniture and leather goods. Late Sept. and early Oct., the community makes sorghum. Over one hundred years ago, as early settlers first tamed the wilderness of the Cumberland Plateau, a curious lot of Victorian Utopians established the first vineyards in the area near the historic colony of Rugby. There, they made wines that won a number of gold medals at wine-tasting competitions in the 1880’s. In 1902, Justus S. Stearns of Ludington, Michigan, established the Stearns Coal & Lumber Company. This logging and mining empire controlled more than 200 square miles of land in Kentucky and Tennessee, built the first electric sawmill in the U.S.; as well as, employed 2,200 people during its’ heyday. The construction of Kentucky & Tennessee Railway allowed the Stearns Company to grow and prosper. Blue Heron, or Mine 18, is an abandoned coal mining town and was a part of the Stearns Coal and Lumber Company’s past operation. The Blue Heron mines operated from 1937 until December, 1962, when operations were no longer profitable. During that time, hundreds of people lived and worked in this isolated community on the banks of the Big South Fork River. Their story is the story of Blue Heron.